"This recipe is so much better than take out! Serve it with homemade fried rice or plain rice. If you like spicy, just add more chili pepper flakes!" Place cornstarch in a large bowl; gradually whisk in water until smooth. Whisk eggs into cornstarch mixture; toss steak strips in mixture to coat. Pour canola oil into wok 1-inch deep; heat oil over high heat until hot but not smoking. Place 1/4 of the beef strips into hot oil; separate strips with a fork. Cook, stirring frequently, until coating is crisp and golden, about 3 minutes. Remove beef to drain on paper towels; repeat with remaining beef. Drain off all but 1 tablespoon oil; cook and stir carrot, green bell pepper, red bell pepper, green onions, ginger, and garlic over high heat until lightly browned but still crisp, about 3 minutes. Whisk sugar, rice vinegar, soy sauce, sesame oil, and red pepper together in a small bowl. Pour sauce mixture over vegetables in wok; bring mixture to a boil. Stir beef back into vegetable mixture; cook and stir just until heated through, about 3 minutes. 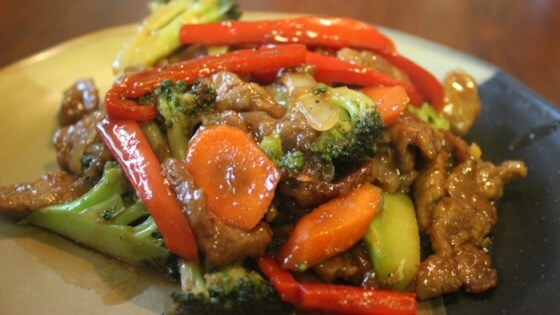 This is the original recipe but I like to add about 1/4 cup of teriyaki sauce as a variation. I also like to add sesame oil to the oil when I fry the beef. The nutrition data for this recipe includes the full amount of the coating ingredients. The actual amount of the coating consumed will vary. We have determined the nutritional value of oil for frying based on a retention value of 10% after cooking. The exact amount will vary depending on cooking time and temperature, ingredient density, and the specific type of oil used. This is absolutely awesome! I followed it as directed with the exception of using moose instead of beef. Perfection! Way to much corn starch in this recipe. Made this as written (except I used a sirloin steak I had) and was delicious!! Next time I will add a small amount of cornstarch to thicken the sauce a bit. Flavor was perfect!! Simply great as is! Used the fresh veggies in my fridge, sauteed with a wee bit of sesame oil added, and followed the rest exactly. Served with Jasmine rice...will certainly make again! Almost overlooked this fabulous recipe! Simple, used up all sorts of veggies, and was a complete hit. THANK YOU.. Fantastic! I even subbed out the cornstarch for arrowroot flour and coconut sugar for the plain sugar. Turned out DELICIOUS!! !